SAP Performance Tuning is the major activity in the SAP as a BASIS admin, because systematic, proactive performance optimization increases the benefits of your R/3 system and reduces the cost of ownership. The consequences of poor performance tuning may be additional work, production delays, and financial loss. 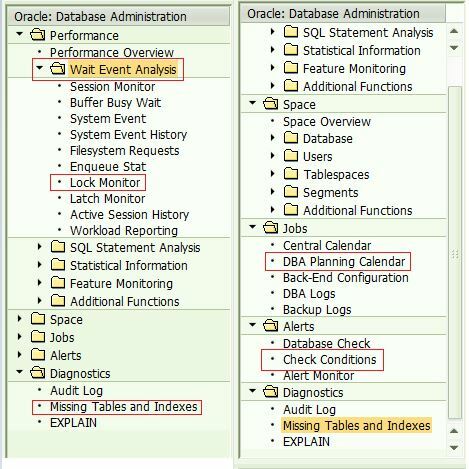 In this post we will describe as how to identify and solve the performance problems in SAP system. Analyze carefully: Before you change anything, analyze your system carefully. Determine the areas of your R/3 system in which performance problems occur. Changes should be performed only in these areas. Keep a record of your analysis data and main thing is that change as little as possible but as much as necessary. Make no changes without analysis: You should never change parameters or take other tuning measures without first performing an analysis. Change suggestions should be implemented only in conjunction with analysis and verification. So blindly applying suggestions from any source can make professional negligence. Verify: Once you have made the changes, perform another analysis. Verify whether the changes have provided the desired results. Keep a record of the data from the verification analysis. Take small steps: As the term tune implies, the success of an optimization depends on the right amount. Therefore you must not make too many changes at once. Only in this way can you maintain an overview of the tuning measures and verify which of them were successful. Every guideline has exceptions: In some situations you may require a different approach than the guideline values or rules of provided by any source. Despite taking every precaution, a recommendation may have negative results. Therefore it is crucial that you perform a verification of every tuning measure taken. This will help you determine why any rule does not suit for a particular situation. Before you going ahead with performance tuning first you need to understand how the communication is happening during running the system between three layers, the diagram is simple flow chart is simple to describe this scenario. Performance Tuning we can categorize into technical tuning and application tuning. Configuring all the components of the R/3 system, so that load placed on the system by users can be optimally processed and does not cause performance bottlenecks. The components for technical tuning are the operating system, the database, the R/3 work processes, R/3 buffers memory management and the net work. Technical tuning is necessary for every R/3 system. 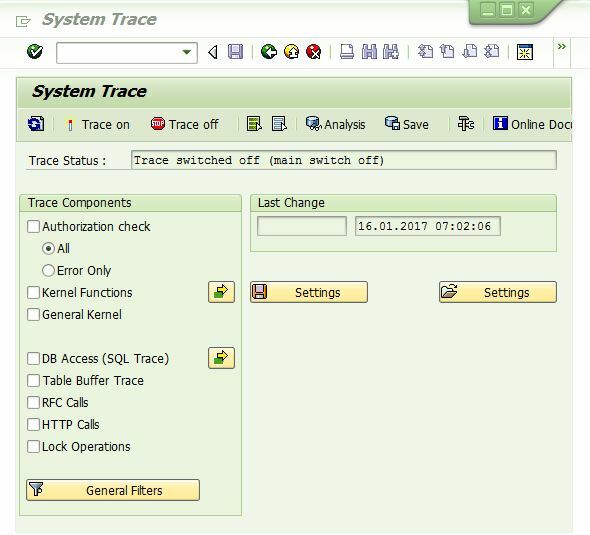 In the technical tuning generally we can check the parameters of work processes, memory allocation, logon groups configuration and load distribution. Which deals with the programs of R/3 application modules. The main focus is on verifying the necessity and efficiency of processes in applications and minimizing the use of resources such as main memory, CPU, network transfers, and hard disk access. Application tuning typically results in more effective use of R/3 transactions or improved performance of customer developed ABAP programs. Application tuning is necessary for every R/3 system. In application tuning, the amount of work required increases, with the size of the installation, as reflected in the data volume, the number of users, and the number of customer developed programs and customer modifications to standard SAP objects. After executing the action list, you should reanalyze the R/3 system to verify the success or failure of performance optimization. If desired improvements are not achieved or only partially achieved, another optimization cycle is required. After large scale performance tuning, new problems sometimes occur, so that also need to be solved. The buffer tune summary transaction displays the R/3 buffer performance statistics. It is used to tune buffer parameters of R/3 and, to a lesser degree, the R/3 database and operating system. The buffer is important because significant buffer swapping reduces performance. Look under Swaps for red entries. Regularly check these entries to establish trends and get a feel of the buffer behavior. In the Command field, enter transaction ST02 and choose Enter (or choose Tools Administration, then Monitor > Performance, and then Setup/Buffers > Buffers). Based on the buffer hit ratio and swaps In the St02 you can get the relevant data as which parameters needs to be checked for further analysis and performance tuning. Hit Ratio: for which the target value is 95 percent and higher. Soon after starting the system, this value is typically low, because certain buffers are empty. The hit ratio will increase as the system is used and the buffers are loaded. It usually takes a day to load the buffers that are normally used. 2. Swaps: for which the target value is less than 1,000. Swaps occur when the necessary data is not in the buffer. The system has to retrieve the data from the database. The swap value is reset to zero (0) when the system is restarted. Workload analysis is used to determine system performance. 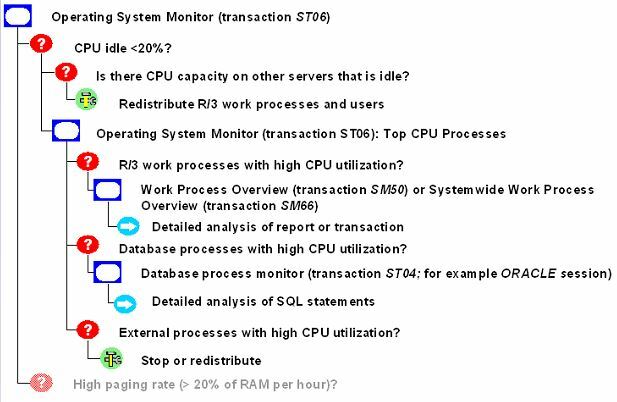 St03 is most important transaction in SAP performance tuning. Statistics should be checked, and trends should be recorded to get a “feel” for the system’s behavior and performance. Understanding the system when it is running well will help determine what changes need to be made when it is not. Choose Detailed analysis menu from toolbar. Choose One recent period from Performance history, Global. We can choose a time period for comparison: Today, Previous days, This week, Previous weeks, This month, Previous months. DB time should be much less than CPU time. Choose Compare all servers from Performance history, Global. 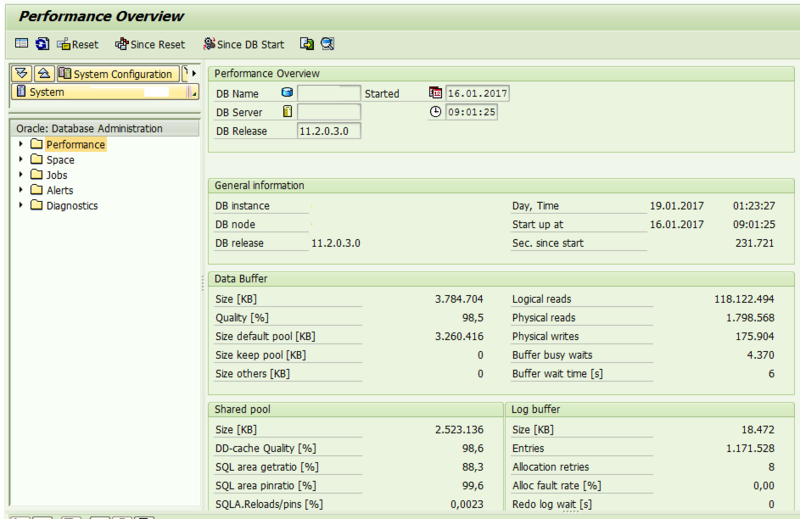 If there is a performance problem specific to an instance, Avg wait time and CPU time will be the best indicators. < 98% could indicate buffer too small or expensive SQL statements. 40 could indicate expensive SQL. < 5 could indicate that the Shared Pool may be too small. Expensive SQL statement reduces the performance of the entire R3 System. 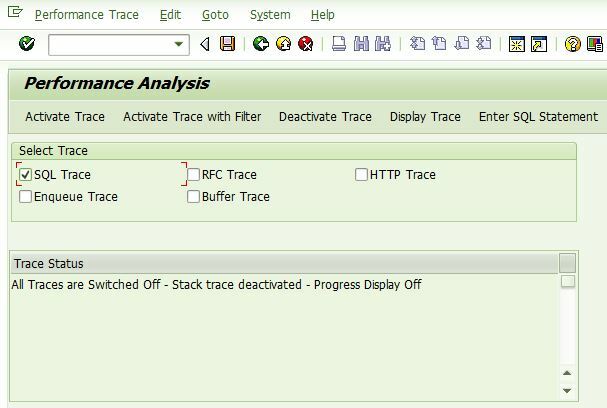 We can also check the ST07 to monitor user distribution based on the application components. its more useful to basis and database administrators..
First time I logged this blog , very informative . thanks for every notes .